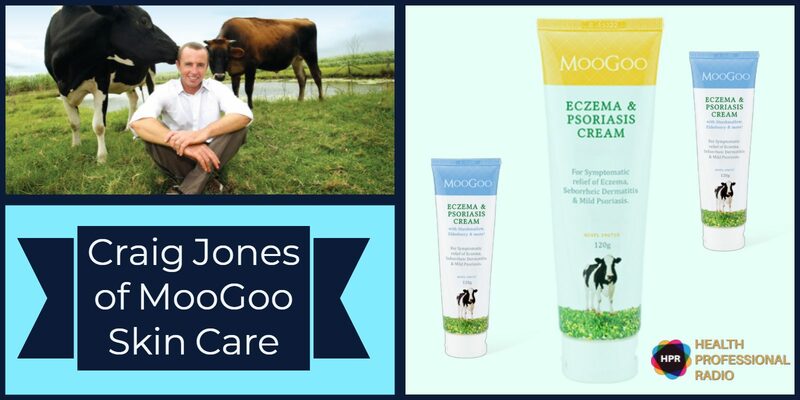 CEO and founder of MooGoo Craig Jones joins HPR to promote his line of natural skin care products he has created particularly for people with skin conditions such as eczema and psoriasis. He talks about how and where he got the inspiration to create these products and why he is so passionate about helping people manage their skin conditions using natural skin care. MooGoo started out in CEO and founder, Craig Jones’ home, when he was searching for something to help his mother with her psoriasis. He decided to whip up a natural cream in his kitchen, as the only cream that had worked for his mum was a cream used on dairy cows. He then came up with his own version, the ‘Udder Cream’ using natural products and, once it cleared up his mother’s skin condition, he was inundated with friends and family wanting it too. The rest is history. Tabetha Moreto: Hello everyone, welcome to Health Professional Radio. I’m your host for today, Tabetha Moreto. Our guest today is Craig Jones, CEO and founder of MooGoo – a line of natural skin care products for people with sensitive skin. He’s here to talk about his company and how people can manage their skin conditions, particularly eczema. Without further ado, welcome to the show Craig. It’s very nice to have you here. Craig Jones: Hello Tabetha, thank you for inviting me. Tabetha: My pleasure. So Craig, please tell the audience more about yourself and your company. How did you get started? Craig: MooGoo started 12 years ago quite by accident, I was doing something completely different. My mother had psoriasis and quite severe psoriasis, it was all over her body except for her face and she was using the other balms they use on cows to to repair the skin on cows’ udders because as you can imagine the milk cups are quite chafing, they can’t be bleeding in the milk or anything so they had this repair balm and she was using this on her psoriasis and a sort of a common country remedy, this particular cream is very thick and pasty and difficult to use so I saw her using that, I took some back, talked to some friends that were in skincare, we remade it so they’re was much more comfortable and it was just for her really and I started using it myself, my wife was using it, friends would come over and that’s how our first cream came about. But now in the 12 years later we’re in about 3,000 pharmacies, we export to about 6 or 7 different countries and it’s just grown and grown which has been fantastic journey. Tabetha: Yes, it sounds like it indeed. That’s good that your mother was able to give you the inspiration that you need in order to create your company and the products that you have now. Craig: Yeah, I mean it’s always been sort of like that, friends or family and now the businesses larger, there’s sort of an obligation to the people that work here as well as well as to our current customers. You can see from our social media, a lot of people are passionate supporters of us and what we make and rely on our products. Tabetha: Yes, that’s fantastic. So what other products do you offer aside from the cream that you mentioned a while ago? Craig: The excellent psoriasis cream is our most popular product but not by a lot. Our second most popular product is a shampoo that we make for people with sensitive scalps or seborrheic dermatitis and dandruff – that’s our second biggest product. We also make products for cradle cap, make a range of products for children with skin problems, make natural sunscreens, all sorts of stuff for people that would tend to react to other products. Tabetha: That’s very good to know. From what I know Craig, Australia has one of the highest rates of eczema in the world, can you explain why is that? Craig: Yeah, it’s interesting. So we do have one of the highest rates of eczema and we have one of the highest rates of asthma as well which as most practitioners would know are linked and there’s a few theories for it. We have a large Chinese Australian population and children of Chinese background in Australia are more predisposed to developing eczema so that could be a reason and there’s various issues around the gut flora and exposure to different pathogens in when a child is very young so our very clean environment here perhaps to do with early antibiotic use but for whatever reason, one in three Australian children can have eczema sometime through their life so eczema is a big problem in Australia. I think it’s a big problem in the States as well. Tabetha: Yes, I understand what you mean. So can you give any advice to our listeners out there, especially those who might have eczema, how can they manage their condition? Craig: Well the trick of course is to figure out what the trigger is to the eczema. So eczema is the immune system reacting inappropriately to some sort of something that it perceives as a pathogen. So in my case for example, mangoes if I have mangoes I’ll break out an eczema about two or three days later and I didn’t discover that actually somebody else pointed that out to me that that was the trigger because the eczema would happen a little bit later. So overall, the main thing is to try and be observant. If you’ve got a child particularly, be observant of what they’re eating that might have changed or what’s changed in their environment. So if they’re rolling in grass, if they’re brushing against a particular tree that’s in flower, that may be the trigger. So that’s all well and good but it’s not going to help them sleep at night while they’re madly scratching so that’s where we come in and also where the medicated creams steroid type creams come in. So general advice would be if it’s a bad outbreak, go to your doctor. Probably get some steroid cream from them so cortisone type cream and then you can use that for a short period of time as per your doctor’s advice, maybe a week or two, to get the eczema under control and that’s where our cream comes in after that. So you can use our cream as long as you need, you just rub it on whenever it’s itchy, that improves the skin barrier function and so that makes you more resistant to eczema. And then while you’re doing that, just be observant about the food and the environment that you or your child is exposed to. Tabetha: Fantastic advice. Thank you so much for sharing this with us. Craig: Yeah, that’s alright. Also, there’s a lot of research around improving the gut flora so probiotics and things like that. Be careful with antibiotic use, particularly as an infant or child as per your doctor’s advice of course. Tabetha: That’s wonderful. By the way Craig, before we go, there’s something I wanted to ask you earlier before I forget. The name of your company MooGoo, where did you get it? It’s so interesting, where did you get that name? Craig: I have to credit my mother actually because the cream that she was using was called udder cream and she was a particular country lady and they can be quite conservative and udder cream to her sounded a little bit crass and so she was the one that used to call it MooGoo so that she wouldn’t have to say the word ‘udder’ in front of her friends I think. Tabetha: Very interesting, thank you so much. And lastly before we go, for those interested in purchasing your products, how can they do that? Craig: Just google MooGoo and we tend to come up and then we’ve got the online store, in Australia we’ve a few thousand pharmacies as well so you can go along to one of those but we’ve also got an office there in the U.S. in Long Beach, California and so we just ship it out from there as well. So yeah, google MooGoo and we’ll always come up. Tabetha: Fantastic. Thank you so much Craig for coming on the show, it was wonderful having you. Craig: Thanks Tabetha, it was very interesting. Tabetha: And that was Craig Jones, CEO and founder of MooGoo. If you liked this interview transcripts and archives are available at www.hpr.fm. We’re on all social media platforms so don’t forget to follow, like and subscribe. Show us some love by subscribing to our HPR YouTube Channel. We’re also available for download on SoundCloud and iTunes. I’m Tabetha Moreto and you’re listening to Health Professional Radio.